I was always intimidated by fish until I stumbled upon this amazing recipe, and I have been meaning to share it for ages. I got the original version from my dear friend Jenny during a mom’s night out recipe swap back when we both lived in Seattle. We were so chatty that night that I only ended up writing down two recipes, but this was one of them. In the years since, I have tweaked it just a bit. It is one of my family’s very favorite meals and it is also a fantastic–and super easy–dish to serve guests, provided they eat seafood. Meal planning eliminates dinnertime stress and overspending. Rather than navigating weeknight meals without a plan, go in with a plan and dinner is served. Simple! GIVE ME MY CHEAT SHEET! The really great thing about this recipe is that it works with pretty much any type of fish or seafood. The original recipe called for halibut, which I love but is very hard to get here in Florida. I have used tilapia, mahi mahi, salmon, flounder, cod, & shrimp with this recipe, and they have all turned out wonderful. 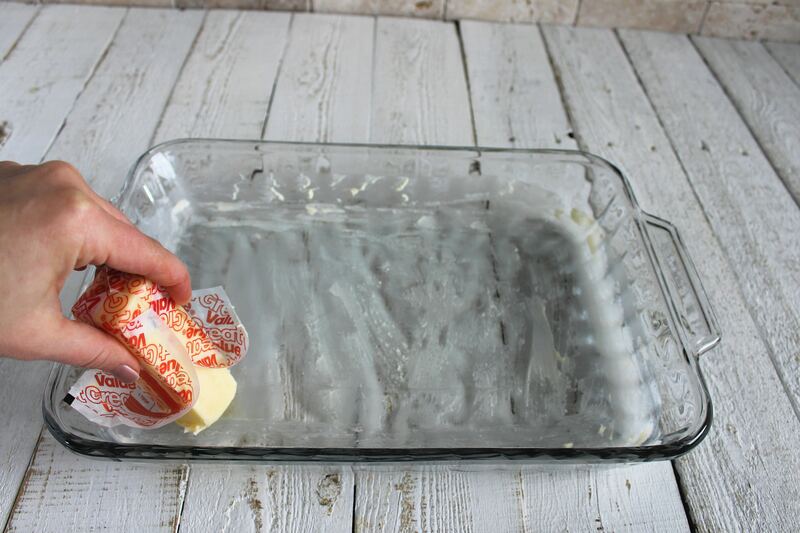 Step 1: Pre-heat the oven broiler; Grease 9×13″ baking dish with thin coat of butter. Step 2: Mix together Parmesan cheese, butter, mayo, lemon juice, green onion, salt, pepper, dill, & Tabasco in small bowl until well blended. 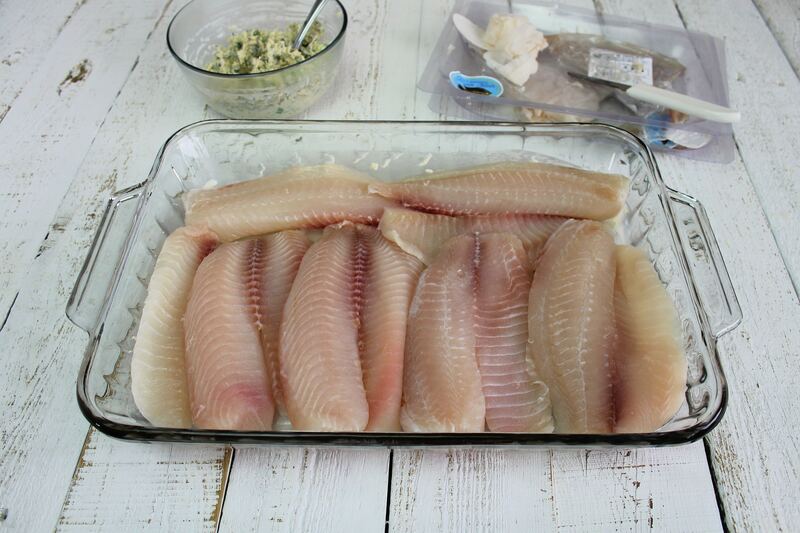 Step 3: Arrange fish in a single layer in baking dish. Step 4: Broil fish for 8 minutes or until it flakes with a fork. Step 5: Remove from oven and carefully spread Parmesan mixture over top. Step 6: Broil 2 additional minutes, or until bubbly and lightly browned. This very best fish recipe ever is savory, creamy and quick. It works with almost any type of fish. It's sure to become a family favorite! Pre-heat the oven broiler; Grease 9x13" baking dish with thin coat of butter. Mix together Parmesan cheese, butter, mayo, lemon juice, green onion, salt, pepper, dill, & Tabasco in small bowl until well blended. 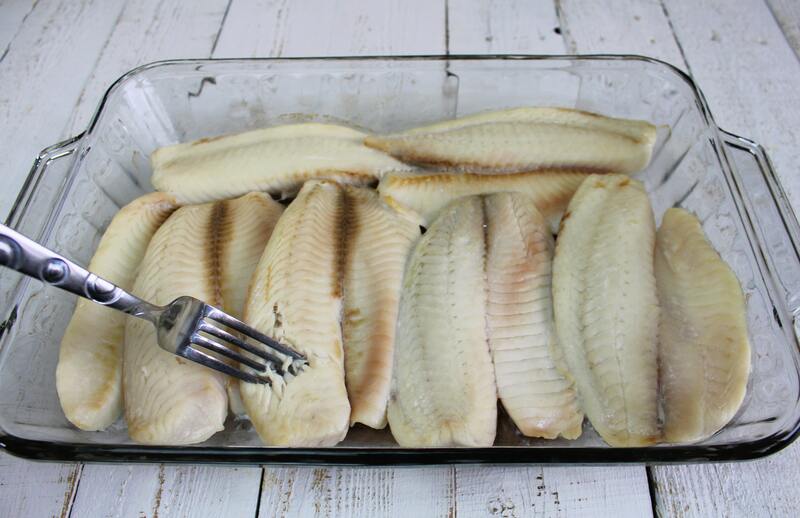 Arrange fish in a single layer in baking dish. Broil fish for 8 minutes or until it flakes with a fork. Remove from oven and carefully spread Parmesan mixture over top. Broil 2 additional minutes, or until bubbly and lightly browned. Oh my goodness, this sounds so yummy! Can’t wait to try it… Thanks Ruth (and Jenny)! Just fed my girls this recipe with salmon. What does everyone serve with it??? I was sceptical about how this fish would taste . But after making it I was blown away it is the best fish recipe ever I used cod .couldn’t stop eating it delicious thank you thank you easy and delicious. OH MY. This looks so yummy! Will have to try it soon. I have the same problem with fish–I love it but I never know how to prepare it, so I just don’t. This sounds so easy. 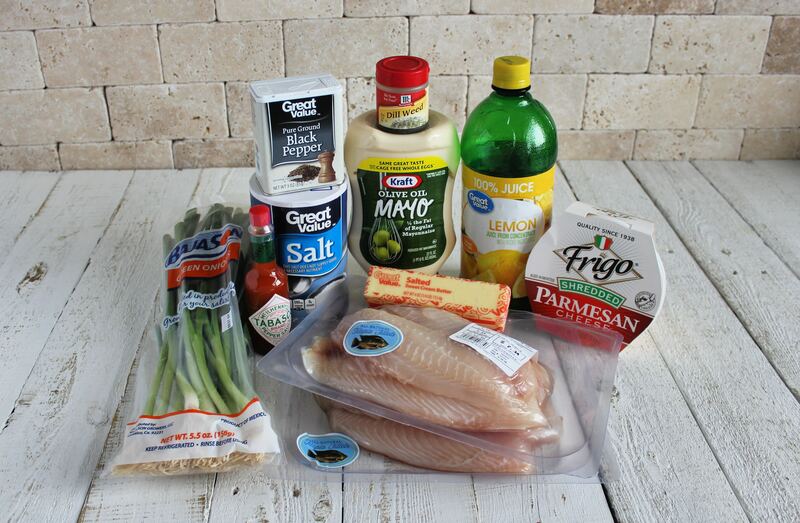 I am adding fish to my grocery list as we speak so I can try it tonight! Ruth- do I turn the fish over during the 8 minutes? Depending on the age of the stove, the broiler may be in the bottom drawer with a broiler pan that slides out for cleaning… do not use this for the recipe though. If it’s a newer stove it will be on the top of the inside of oven… move rack to top spot. Only the top oven element comes on when you broil. Your welcome, Ruth. We love this recipe! This recipe sounds yummy!! Thanks for sharing. This sounds delicious! I’m not such a huge fan of fish, but with creamy parmesan cheese, you can’t go wrong. Will have to try this soon. Thanks! Can’t wait to try this! We have a deep freezer full of fish that my husband caught. I know once I find a good recipe for fish (trout), it will be a once-a-week dinner at my house! This sounds great! I’m always looking for yummy fish ideas, thanks for sharing! Love your blog!! My family loves fish but I’ve always been to nervous about cooking it. With this recipie…I think I can! Thank you! One quick question though…would you preheat the oven to broil low or high? My oven has a choice of settings. What would be a good side dish with this meal? Going to try it this week! Looks great! I used to order this at a restaurant in north Florida called Harry’s seafood. I always got the server to order me steamed broccoli and some of the same sauce on top. Completely sinful! Really enjoyed this recipe. Made it and put over rice. Delish! Thanks for sharing! Am not a fish lover.. But trust me i tried this recipie and its amaziiiiinnnnnngggggg …. Thank You for this yet very simple and tasty dish !!! It’s not my recipe, but I wouldn’t be scared to bake it. If it were me I’d bake at 350 for about 25 minutes (or until flaky). I saw a recipe for tilapia that was 425 for 15 min. What would the cook time be if the fish are frozen? This was so good. Even my six year old loved it and he hates fish! Made this for supper and my husband commented that it was excellent and he would like me to make it again sometime. I also thought it was very tasty. Thanks for the recipe. I am going to pin it for sure! I’ve made this often with fresh catfish. Very good fish recipe. I used to have fish fairly often but stopped when it became so difficult to buy fish from USA, not China. Where there are very poor sanitation standards. This recipe sounds delicious so I may just have to ignore the country of origin once in awhile. One question: is the Parmesan cheese shredded (strips) or grated (powder)? Thanks for posting. The Parmesan Cheese is shredded. Go to tilapia.com – Publix stocks tilapia from Costa Rica and I am comfortable with the standards in Costa Rica. OMG!!!! This is the BEST fish dish I’ve ever made!! I’m trying to get my family to eat more fish and this dish I will make again and again. Thank you so much for this delicious recipe!!! I’ve made this several times since finding your post. Seriously, this recipe is absolutely delicious! My family loves it! This was delicious! Used cod and substituted a few tablespoons of sriracha for the hot sauce. Entire family (4 kids included) ate, enjoyed and asked for seconds. Will double recipe next time! Tried it tonight with tilapia–delicious! Halved the recipe and it was the perfect amout for my husband, 2-year-old, and me. Hey! Sounds great but I had a few questions….do you broil on low or high? And my 9×13 dish says “no broiler”- do you put it on the top rack, near the broiler or in the middle? Thanks! I just made this last night, it is really delicious! thank you!! they are farmed, they are a bottom feeder, thus they eat their own poop. This recipe was great! The sauce is so good. My parents raved about it and even requested the recipe–something they almost never do. Thanks so much for sharing. Made this for my fiance tonight and its delicious! We loved it ! any idea what the calorie content of this would be? What sides are good with it? Rice or potatoes? I want to make it I want to make it tomorrow? 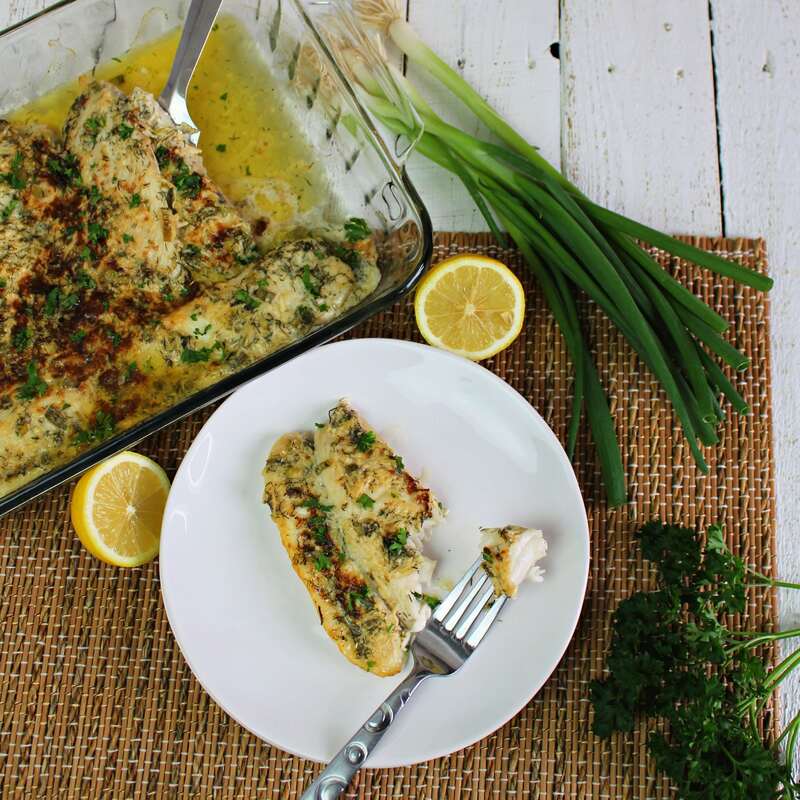 My husband and I are eating low-carb, and I made this fish the other night, using tilapia. It really was one of the best fish recipes I’ve ever made! My husband loved it and he is REALLY picky about how fish is prepared. My kids loved it too. I plugged this recipe into a carb calculator and for 8 servings, it only has 2.6 carbs each. Wonderful! (Sides for us were green beans and a fresh tossed salad.) Thank you for a great recipe that I’m sure I’ll be making again and again! You live in Florida and use Halibut, cod, talpia, salmon, etc…fish shipped in from miles away and Not grouper, snapper, amberjack, etc.. Fish caught locally? And it STILL tastes good? that is quite an endorsement. But why not use fresh local? This looks delicious! I love fish but I’ve never prepared it with any type of mayo topping. Can’t wait to give it a shot! When broiling, how far should pan be from broiler? I want to make this for company tomorrow – it sounds yummy. I’ve been using this recipe for years, however, next time you make it, use lump crabmeat in the recipe. It can be fresh or canned (2 cans). If you add that to the Parmesan mixture, it takes it to another level! We’ve named it Heavenly Trout or Heavenly Flounder. It works best with a clean white fish. Living on the southern coast of Texas, and fishing any chance we get- that’s what’s stocked in our freezer at all times. I’m CONSTANTLY looking for new recipes. This sounds so easy to make! Can I use mozzarella instead of Parmesan? Is it broiled on low or high?? Question is not answered. Too heavy for our tastes. We like fish! Thank you so much for this recipe! We were the only eat baked fish out or choke down my dry not tasty fish (which is the reason I stopped cooking Italy home), but this recipe has changed fish cooking for me. 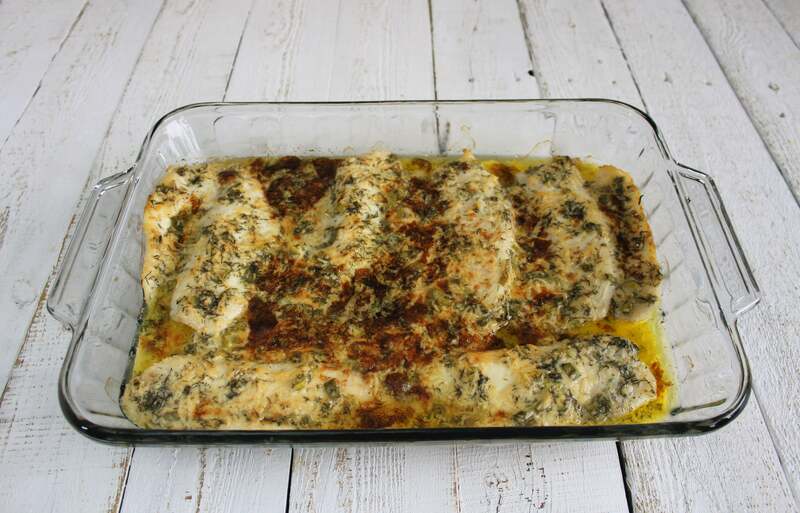 Tonight we will have baked fish this way for the 4th time in a month- Wow! Thank you so much!!!! Do you have the nutritional info for this recipe? I’m trying to make it healthier, do you think I can substitute the mayo for greek yogurt? Just found this recipe today and have to say it look delicious. However anyone making this as written should be aware of one thing. 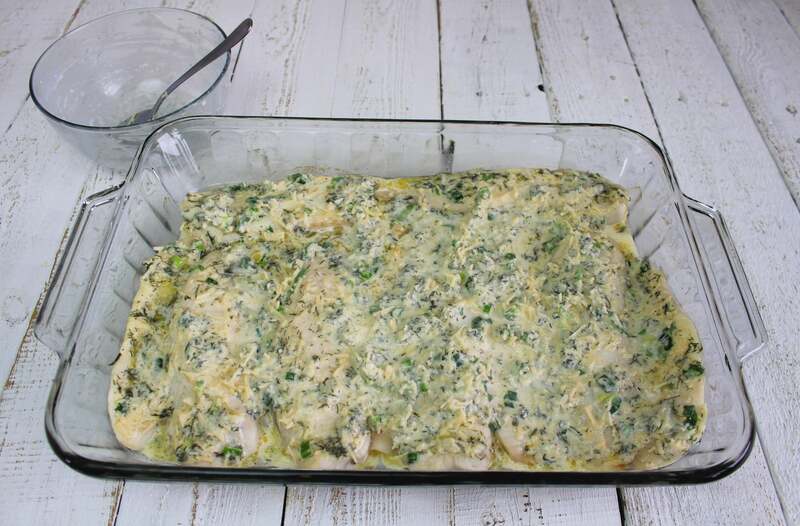 In the directions it calls for using a glass baking dish under the broiler which you CANNOT do. It may shatter the dish. Most of them will say on the bottom of the dish not for broiler use. Find something else to use if broiling. HI my name is REX, i live in AUS, i have a fanforce oven,would like to try this recipe. I wonder how this wold be with shrimp..scallops..and crab.. I was wondering if anyone has tried this mixing several kinds of fish-perhaps flounder, scallops and crab? I absolutely can’t stand Hellman’s style mayo, the lemon in it smells and tastes horrid to me; and I’m actually not a mayo eater in general, we’re a Whip family. I gave this a whirl using Heinz mayo. For anyone wondering what the dish tastes like: It tastes like fish baked with a cheesy Lemon Dill Tartar Sauce. I enjoyed it much more than I thought I would by the smell after I mixed the lemon juice into the mayo. But it will definitely need some tweaking to suit our family’s tastes if I make it again. Like cutting the lemon in half, tripling the hot sauce, and reducing the butter a bit. One thing I added this time that was a definite bonus was Capers and Pimentos, they worked VERY well in it and made the presentation very lovely. I’m looking fit a great fish recipe for my whole family. Is this spicy? Hoping to try it tonight. Thanks! Do you think it would taste the same if I halved the recipe? We won’t eat 2 lbs of fish and my husband won’t eat leftover seafood…..
Can I use the powdered parmesan cheese since that is what I have or does it need to be the shredded kind? I am going to try this tonight. My husband and I like fish but my boys hate it. Hoping they will eat this. You can try it with what you have on hand. It just might not have the full flavor of shredded Parmesan. Been looking most of the day, trying to find a recipe using fish, buttermilk, etc. I have come up empty! Here it is almost 7 pm, fish is waiting patiently. Super Bowl is going on, and here I sit looking for some kind of recipe. I am ready to scream! I am going to subscribe to your site! Thanks for listening! I made it tonight…it was awesome. My girlfriend and I enjoyed it tremendously. Thank you for sharing! I made this for my husband – I do not eat meat or fish so I rely on recipes for his survival – he said this is amazing! I will definitely use this again!! We both thank you!!! Would it ruin the recipe to use miracle whip? I have to make fish for 16 guests , but few of them hate cheese , can I make this without Parmesan cheese or you think it would taste boring ? I’ve been making this dish for about two years now. It is a regular at our house. For a cheep meal use I use Swai white fish. But to really impress the company Red Snapper makes this recipe sing. The only thing I change is I don’t add salt. Mayo, lemon juice and Parmesan cheese are enough saltyness. Thanks for the great recipe. This was delicious!!! Thank you so much for sharing this recipe. Tried this with Swai, turned out terrible. Worst fish dish so far! I’m so sorry this recipe was not to your liking. OMG! I love you. Thank you so much for the recipe. It was so delicious and really easy to make. I’m definitely adding this to my monthly rotation of recipes. Thank you again. Hi, would this go with smoked hake? Recipe sounds awesome! Yum. I used Alaskan cod which is fairly thick, so I cooked the fish a bit longer than instructed. If you use a thin fish like flounder or tilapia, the time may be shorter than instructed. It was very delicious and I will make this again and again! Do you think this would work with breaded cod? I’m trying use up what I have in my freezer. I have made this recipe three times this month. Each time it is flavorful and a crowd pleaser! Thank you for sharing. Goes great with roasted broccoli. Wow! Very good… everyone except the boyfriend (who refused to even look at fish…lol) loved it!! 4 teenage boys and me thought it was amazing. I did use orange juice instead of lemon cuz I flaked at the store. I will be making often, u should too!! After I made this the first time (using tilapia), my husband said it’s his favorite way to eat fish. I just made it again for the second time ( with Swai), but I replaced the dill with Old Bay. It was SO good both times. We had ours with kale (with butter, salt, pepper, sautéed onions and a squeeze of fresh lemon juice) and broccoli. It made for a delicious low carb meal! I will definitely make this again and again. This recipe is wonderful! I had frozen salmon fillets and was wondeing how they were going to taste! Came out amazing! I did thawe the fillets before cooking. Making this again tonight using grouper fillets! I have a question: what do you suggest as side dishes to complement this recipe? Thanks! I’m in Australia and have no idea what a broiler is. Would this be similar to the grill element in the oven? Would love to make this but not sure how to cook it. Wow what a delicious fish recipe. Justt made it, so easy and quick. My son here for supper, he loved it. This is by far the best!! This comes from someone who thinks fish is boring. Thanks!!! When you broil the fish, do you keep the oven rack in the middle or do you move it up closer to the coils? My broil setting gives me temp options, (500 degrees is high) am I going for a lower temp or the higher temp? Also, I’ve never cooked with fish, so I don’t know how it fares as a leftover dish. It’s just me and my husband so I often have leftovers from recipes I make. Has anyone tried this reheated? Thanks! Looks amazing! I made this for dinner tonight and talk about good!!! I didn’t have any lemon juice, so I added lemon pepper seasoning and used yellow onion diced. I must say that it was sooo delicious!! I also used parmesan cheese in the green can. Thank you so much for posting this!! I can’t wait to try this again with the ingredients you included in this recipe. I’m on a Keto diet and I don’t see the nutrition breakdown. 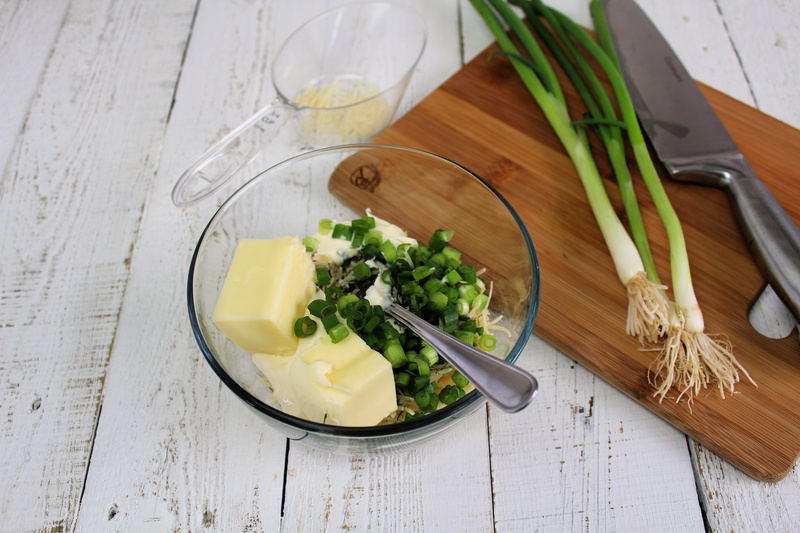 This recipe seemed too simple to be seriously delicious – but it’s seriously delicious! I didn’t have a couple of the ingredients so had to improvise. It *still* turned out amazing. Instead of lemon juice, 1 T. Dijon mustard worked great. It also compensated for not having tabasco sauce, this time. Hopefully I’ll have it handy for next time – and there WILL be a next time. We are Floridians and know good seafood. This was restaurant quality. Where can I find freeze dried dill? Would this recipe be good with fresh Amberjack? What a fantastic recipe!!!!! It is sooooo delicious… not a piece of fish or sauce leftover! I used haddock, and the avocado mayo that Costco carries (by Chosen Foods); forgot the dill… but it didn’t seem to matter considering how quickly this meal was devoured! That sauce is amazing! This will definitely be a regular in our meal rotation… thank you so much for sharing it! This sounds delicious and easy…two of my favourite words when it comes to cooking ! 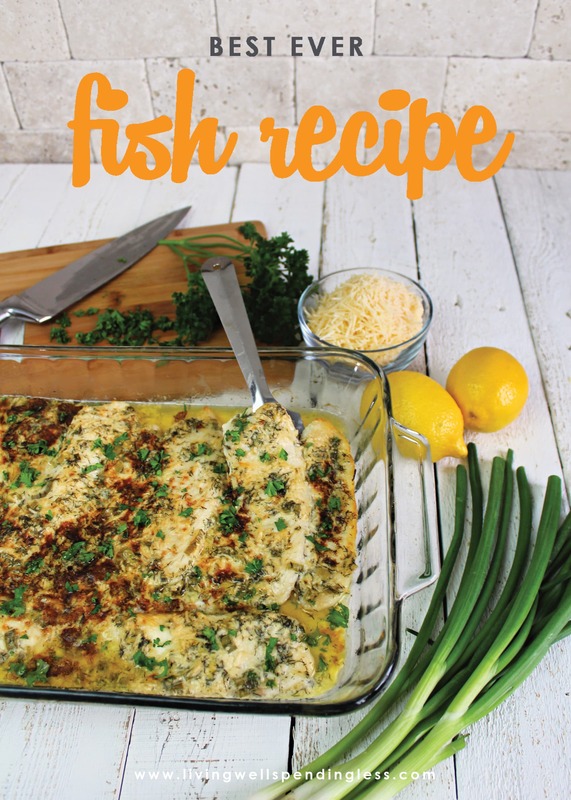 I plan on making this and was wondering if anyone has used basa fish fillets ? AWESOME – Ingles had mahi-mahi on sale today and we just had to try it out. Thank you, this is going into my Seafood section of my cookbook. You’re right! This is the best ever fish recipe. I don’t usually like fish, but this is DELICIOUS! I’ll be eating more fish from now on. Thanks. This was EXCELLENT on tilapia! I’m going to try it with shredded chicken and broccoli as a “bake”. I”ll be winging that dish, but at least I know that the butter-mayo-cheese part will be divine!